Performers include: Diedrich Bader, James Arnold Taylor, Dee Bradley Baker, Will Friedle, Will Friedle, Greg Ellis, Tom Kenny, Kevin Michael Richardson, Corey Burton, Jason Marsden, Alexander Polinsky, Grey DeLisle, Thomas F. Wilson, Jeff Bennett, Sean Donnellan, R. Lee Ermey, Oded Fehr, Mikey Kelley, Scott Menville, Phil Morris, Jim Piddock, Bumper Robinson, James Sie, Tom Everett Scott, and Billy West. The caped crusader is a force to be reckoned with on his own but, when Batman (Diedrich Bader) ventures beyond Gotham City limits and joins forces with other heroes, the villains don’t stand a chance. 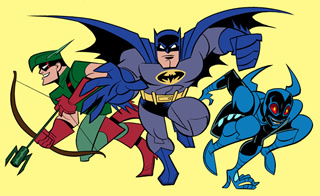 Based on the printed DC Comics series, The Brave and the Bold, this animated show features Batman as he teams up with other heroes from the DC Universe. Filled with non-stop action and adventure, the series has a considerably lighter feel to it and even makes occasional references to the campy Batman series from the 1960s. And yet, it still touches on darker topics, retelling the murder of Bruce Wayne’s parents, the death of The Blue Beetle (Wil Wheaton), and the assassination of Boston Brand who then became Deadman (Michael Rosenbaum). Working with heroes like the new Blue Beetle (Will Friedle), Green Arrow (James Arnold Taylor), Aquaman (John DiMaggio), Adam Strange (Michael T. Weiss), Plastic Man (Tom Kenny), Wildcat (R. Lee Ermey), a now grown-up Robin (Crawford Wilson), Sherlock Holmes (Ian Buchanan), and countless others, Batman faces situations that are both unfamiliar and exhilarating. With formidable foes around every corner, Batman still relies on his stealth, resourcefulness and limitless supply of cool gadgets to bring justice home. Classic comic villains that the heroes encounter include Catwoman (Nika Futterman), Two-Face (James Remar), Black Manta (Kevin Michael Richardson), Psycho-Pirate (Armin Shimmerman), Crazy Quilt (Jeffrey Tambor), Sportsmaster (Thomas F. Wilson), Kanjar Ro (Marc Worden), and the dangerously mischievous Bat-Mite (Paul Reubens). Opening teaser: In the year 1865 in a parallel universe, Batman helps foil an assassination attempt on the life of President Abraham Lincoln by a steam-punk armored John Wilkes Booth. Main story: Bat-Mite has grown weary of Batman: The Brave and the Bold. He concocts a scheme to make the show so bad that the network will have to cancel the series to make way for a darker one. As viewership dips, the world begins to disappear and Ambush Bug begs viewers to keep watching. Meanwhile, Batman and Aquaman try to defeat Gorrila Grodd’s evil plans. To thwart Ambush Bug’s efforts, Bat-Mite introduces elements that often signal the end of TV shows — Ted McGinley (voicing Aquaman), a Scrappy-Doo like sidekick, and over-commercialization. In the end, the show is cancelled and replaced by a Batgirl series. Bat-Mite has mixed feelings about this. Ambush Bug appears to remind the little guy that he’s part of Brave and the Bold too so he’s going to disappear as well and he does. First aired: February 22, 2008. I had only seen a handful of episodes but the finale hit me in the feels such that I went back to episode one and went thru the entire series.